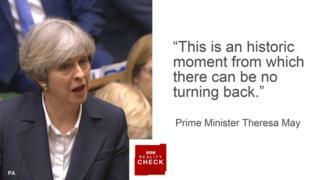 The claim: Prime Minister Theresa May says there is no turning back from the triggering of Article 50, which starts the process of leaving the EU. Reality Check verdict: The government is clear that it respects the result of the referendum, so it argues that any debate is theoretical. However, the question of whether Article 50 is irrevocable is the subject of legal dispute. Article 50 of the Lisbon Treaty was written with a deliberate lack of clarity - it does not say whether it can be revoked once it has been triggered. As a result, the UK government has been unable to make any definitive legal statements on the issue. The Justice Secretary, Liz Truss, has said "My understanding is that it is irrevocable," while the Brexit Secretary, David Davis, said in December 2016: "Is it irrevocable? I don't know." In the recent UK Supreme Court case on Article 50, both sides assumed that it was irrevocable and the court judgement concluded: "We are content to proceed on the basis that that is correct, without expressing any view of our own." So this is not an issue that has been formally tested in a UK court. But European Council President Donald Tusk has said that he believes Article 50 can be reversed. When asked if the UK could unilaterally withdraw its Article 50 notification during the next two years, he said, "Formally, legally, yes." Lord Kerr - the former British ambassador to the EU, who helped draft Article 50 - agreed. "You can change your mind while the process is going on," he said. He acknowledged that this might annoy the rest of the EU, and be seen as a huge waste of time. "They might try to extract a political price," Lord Kerr said, "but legally they couldn't insist that you leave." The distinction between political and legal opinion on this issue is critical. The politics might become way too complicated if the UK tried to change its mind. But who might have the final legal say on what could yet become a critical question? Article 50 is a piece of European law, so the ultimate arbiter on this issue is the European Court of Justice. There is an ongoing case in Dublin at the moment that is seeking to refer the question of irrevocability to the European Court to get a definitive answer. One other point is worth bearing in mind: everyone is talking about a two-year period for negotiating under Article 50, at the end of which the UK would leave the EU. But Article 50 does provide for that two-year period to be extended, if all 28 EU countries, including the UK, agreed. No-one is advocating that, but it remains a legal possibility. The argument that Article 50 cannot be reversed once it has been triggered has not been tested in court. The rest of the EU has said it does not want the UK to leave, but - politically speaking - it would be very difficult to revoke notification of Article 50, and the current UK government says it has no intention of doing so.